The skillful use of questioning techniques has the power to enhance students' critical thinking skills, deepen their engagement, and better prepare them for college and careers. 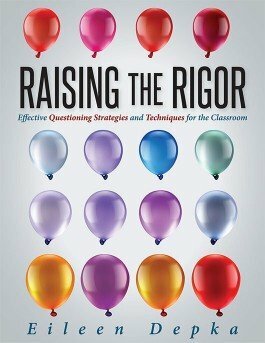 This book shares questioning techniques that educators can use to respond to students' diverse needs while maintaining rigor and relevance. Teach students questioning strategies via Socratic circles and Bloom's taxonomy to build connections between students and their conceptual understanding. Explore example situations, and use templates and student-engagement strategies to encourage advanced discussions, collaboration, and risk-taking in the classroom. Discover how questioning can promote the traits that students need for college and career readiness. Examine instructional practices and examples of rigor in the classroom you can use to respond to students as they develop 21st century skills and conceptual understanding. Explore how to deconstruct standards and standards-based questions to write quality questions that align with the expected levels of complexity. Create a classroom climate that fosters collaboration and constructive discussions, teaches higher-order thinking skills, and increases student engagement.